Are you looking for something to help dress up your baby shower decor? 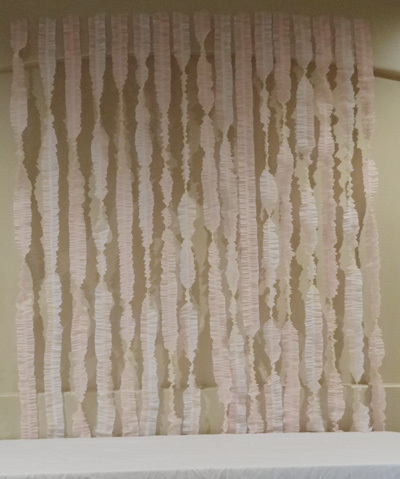 With a little creativity, you can transform traditional crepe paper streamers into a beautiful backdrop, focal point or entrance for your baby shower. Your guests will think they took forever to make. We will let them think that. But the secret is... ANYONE can make them. 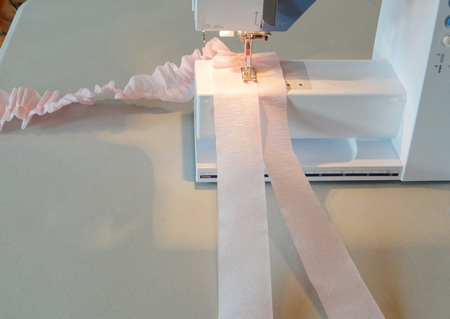 If you can push down a sewing pedal, you can make crepe streamers. For my baby shower decor project, I made 2 sets of backdrops for tables. To give you an idea of how much you will need...I used 4 rolls to create a backdrop for 1 table. It made 18 double ruffled streamers. The best part?! It cost me $4 to make a backdrop. You heard me right. 4 whole dollars! I already had the thread so the cost was just for the streamers. It is a perfect decoration if you are on a budget and you want something easy and beautiful. Ready to Start? Set the stitch length at its max. All sewing machines are a little different. 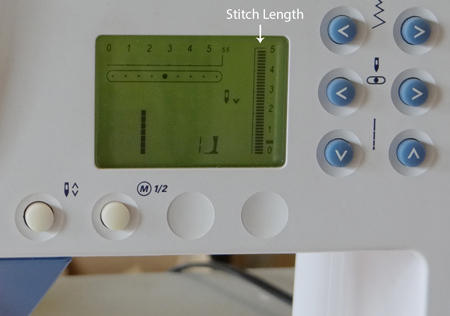 But basically, you need to locate the stitch length on your machine and set it as high as it will go. I set mine at a 5. This is what it looks like on my machine. Next we need to turn the resistance up all the way. On my machine, the knob is on the top. I set mine at a 10. The combination of both the long stitch length and the resistance will create ruffles. I love watching it as it goes through. Just like magic! 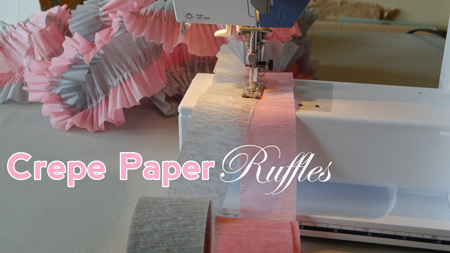 You will be pulling crepe paper from 2 rolls to make the ruffled streamers. It has a tendency to easy twist up and roll as it is pulled. To make things faster and so you don't have to stop to fix it, I am going to show you a neat little trick. 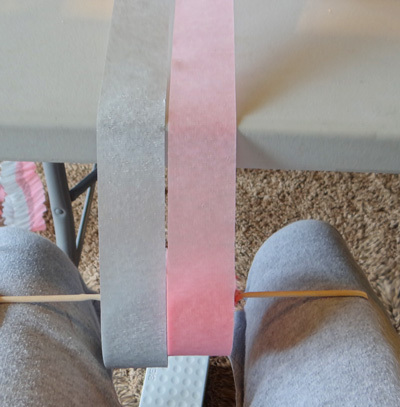 If you thread a small wooden dowel through the center of both rolls of crepe, you can place it on your legs while you are sewing. Line up the ends of both crepe paper so that the slightly overlap in the center. 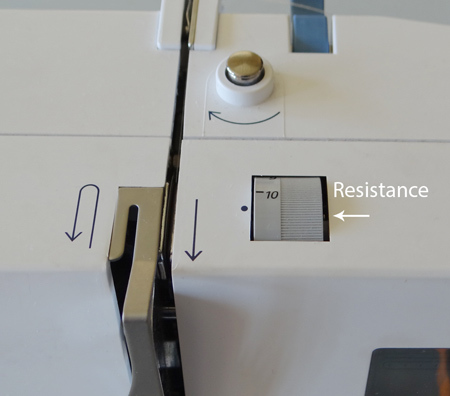 Place it under the pressure foot of your sewing machine and sew. Keep sewing until you get to the end of both rolls of crepe paper. As you sew along, make sure to keep the crepe paper overlapped so it is sewed evenly. That's it! If your stitches are not straight all the time, don't worry. 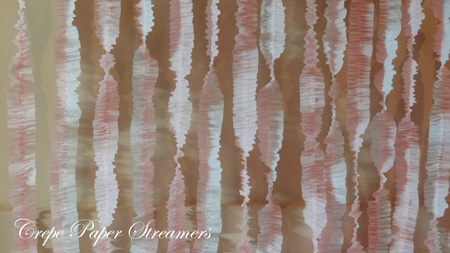 That is the beauty of crepe streamers, the ruffles will hide any imperfections you make while sewing. 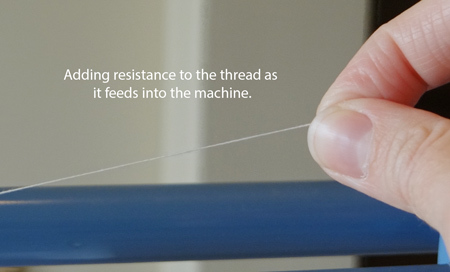 Tip: As I was sewing, I lightly held onto the thread as it was going into the machine. It added a little more resistance, causing the ruffles to be a little more defined. Play around with it and find the perfect look you like. 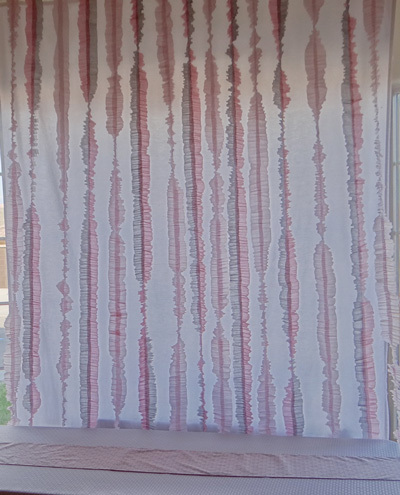 In the picture below, I actually hung a clean white bed sheet behind the crepe streamers to block out the street outside. It helped create the look I wanted, and the light filtering in looked really nice. Crepe comes in a rainbow of colors, so the possibilities are endless to mix and match colors to get the look you want. 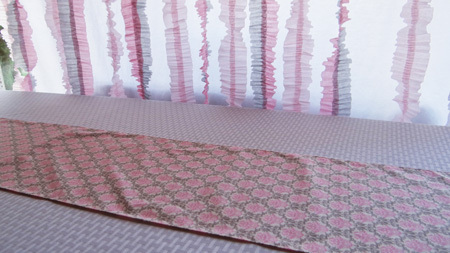 When I started this backdrop, I had a roll of pretty grey and rose pink in my stash that I was using. I loved the color combination. When I finished the roll and went into town, I found that none of my local stores carried either color. :( So I blended in a lighter pink to finish the backdrop. If you want to use special colors and have time before the baby shower, make sure to order it online to get what you want with time to spare so you can use it for your baby shower decor. I hope you enjoyed this tutorial. We would love to see pictures of your baby shower decor! You can share them with us here.